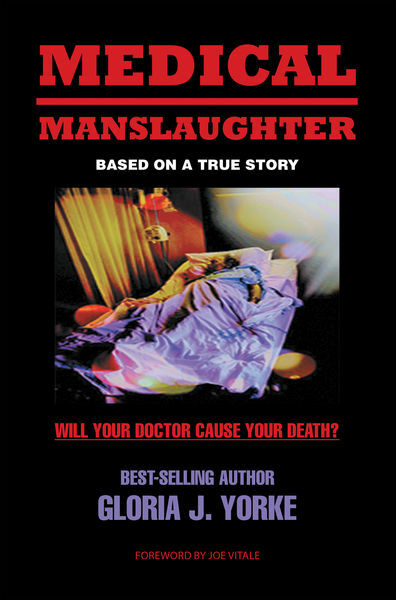 MEDICAL MANSLAUGHTER, Best-Selling Author, Gloria J. Yorke, exposes a hidden epidemic that is plaguing our Medical Field today…deaths by DOCTOR ERROR! MEDICAL MANSLAUGHTER…A must read for everyone AND every Book Club! MORE THAN 400,000 PATIENTS DIE EACH YEAR, DUE TO DOCTORS MAKING MISTAKES! WILL YOU BE THE NEXT VICTIM OF DOCTOR ERROR? LEARN…What ERROR put Nick in a COMA, only 3 DAYS prior to his being Discharged from the hospital! SHOCKING…Hospital said, “LET HIM DIE,” when they could not reverse the Coma! THE DEPARTED ARE STILL VERY MUCH ALIVE !!! MIRACULOUS… Against ALL odds, Gabriella was determined to bring Nick out of his Coma. Unbelievably, he awoke 34 days later while in a Nursing Home. Learn how she did it! SPIRITUAL…6 Miracles occurred…PRAYER is POWERFUL! Discover a Special PRAYER to The BLESSED MOTHER, that is NEVER FOUND TO FAIL! Interwoven within this hair-raising Novel, you’ll be mesmerized by the uncompromising love and dedication demonstrated by Gabriella, as you witness the power of her unshakeable faith, and Nick’s determination to live! Empathize with Gabriella, as you observe the stamina and courage, that it takes to be a superior Advocate, relying heavily on only your intuition. PREPARE TO BE ENLIGHTENED… YOU WILL NEVER LOOK AT THE MEDICAL FIELD THE SAME AGAIN!GUARANTEED!